Mark Tan has won one of CIFE’s college awards for his excellent contribution to all aspects of life at Brooke House. 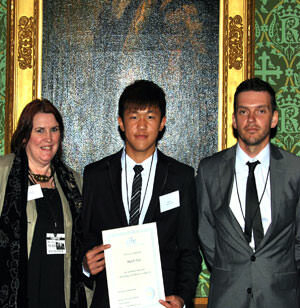 he received his award from CIFE President Pauline Perry at a ceremony held in the House of Lords this March. Mark displays a superb attitude towards his learning, interacts and participates admirably in class, sets himself high standards and continually aims to achieve his goals. He is unfailingly good natured and helpful to staff and other students and can be trusted implicitly to set an admirable example to others. He is expected to achieve excellent results in his chosen A-levels. Mark has also been an exceptional student both on and off the pitch throughout his four years at Brooke House College Football Academy. His efforts in training sessions and games have been of the highest level and his achievements in the game are well deserved.